There was so much drama at Houreyes, the salespeople were caught up into some twenty-something mess that made me not want to be there. Determined not to let other folks stuff bother me, I got up outta of there quickly. I didn't even sit for a proper fitting. Oh well! I can always go back and have them tighten a bolt or make an alignment. Anyway! 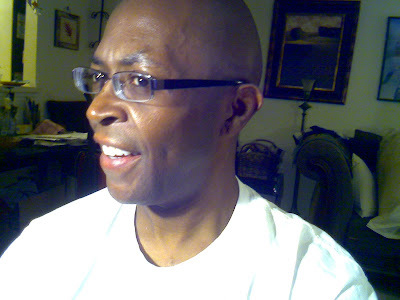 My niece says I look like Malcolm X in my new glasses, I told her yeah right! LOL! I will stay up to date so that I do not have to stay up all night readind and catching up(Smile)here. Hi there, so you've found me. I was thinking that any images of me had been tucked deeply away in my archives. Once I get my head cleared out a bit, I like contributing to my own blog. So thanks for reading. We're all so busy.